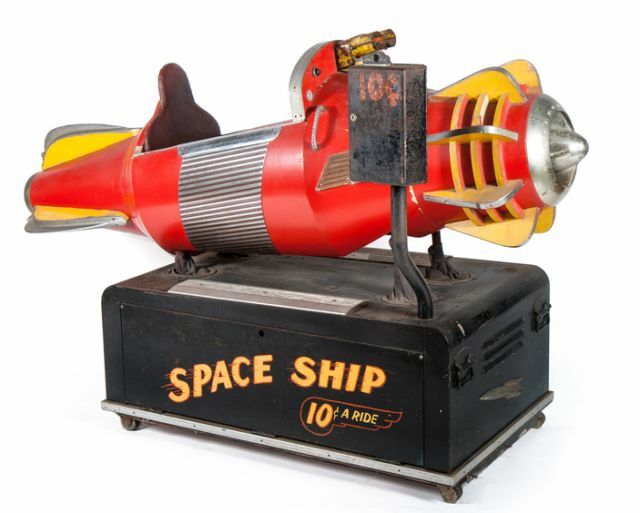 ALL SCI-FI :: View topic - The Amazing "Touring Rockets" of the 1950s! 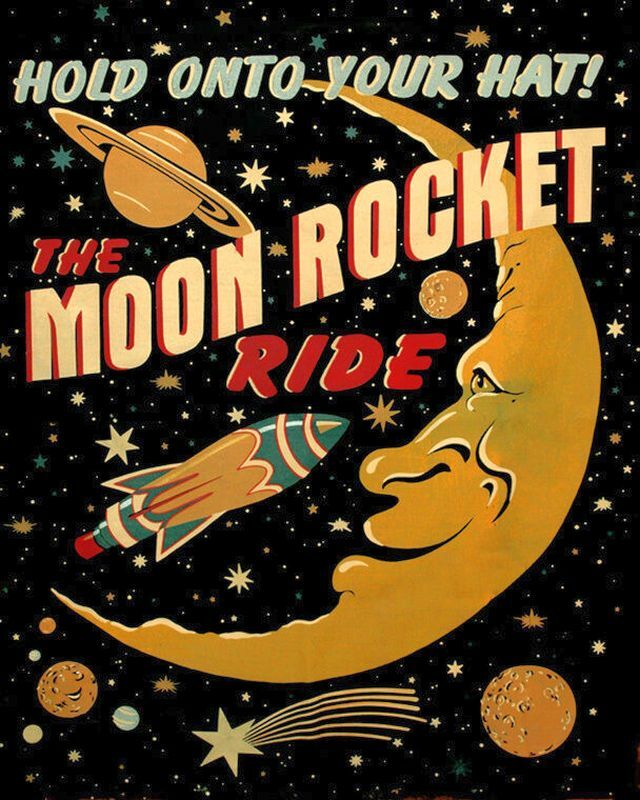 The Amazing "Touring Rockets" of the 1950s! Ricky's ray gun looks awesome! 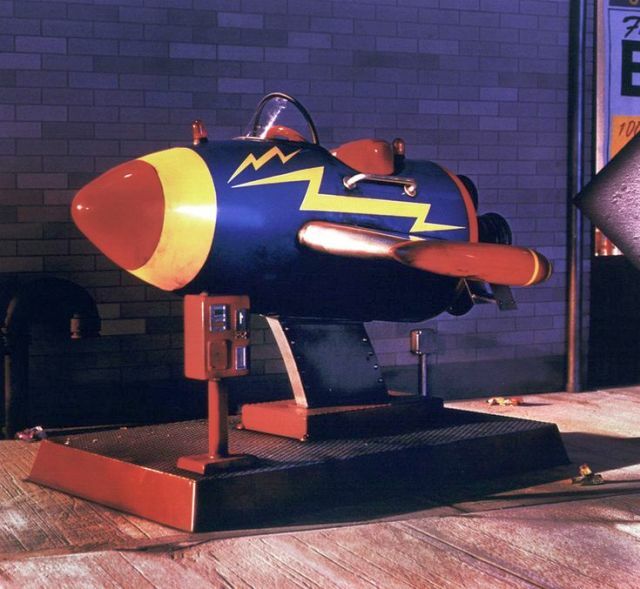 It's a MARX Signal Ray, it also had different names. To me, one of the best looking toy ray guns. Brother, you ain't kiddin'! These things are gorgeous. And eBay has the blue one for the low, low price of just $90.00! 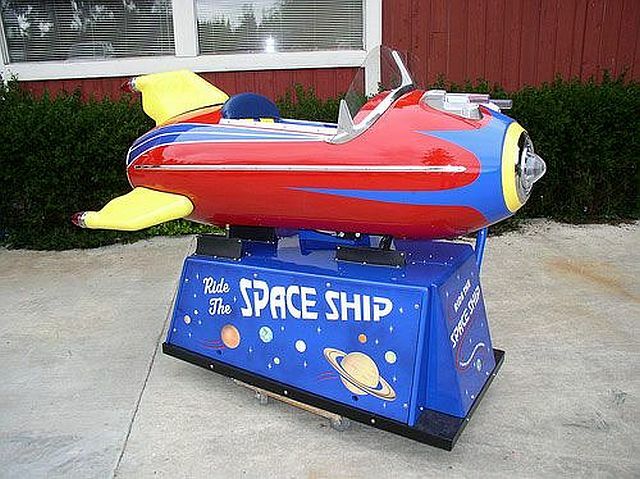 We've looked at the great "Traveling Rockets" of the 50's-60's era. 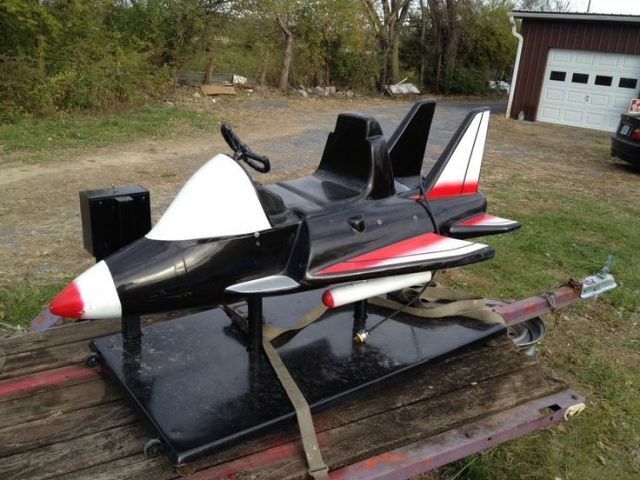 We've even looked at some of the amusement park rocket rides including the Disney themed ones. Just imagine....A WHOLE park devoted to all things space and time! 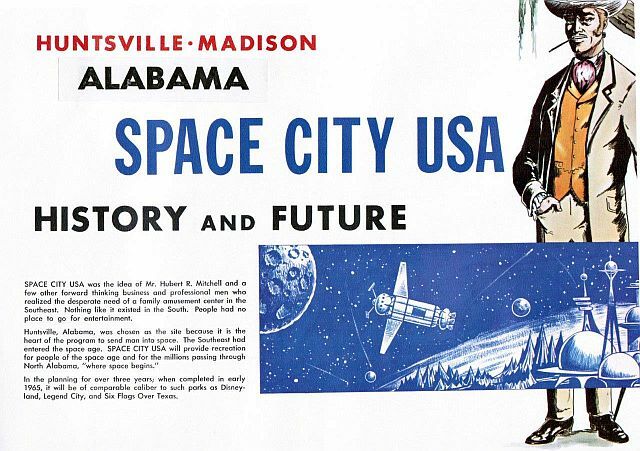 Space City USA is the biggest thing that never happened in Huntsville. 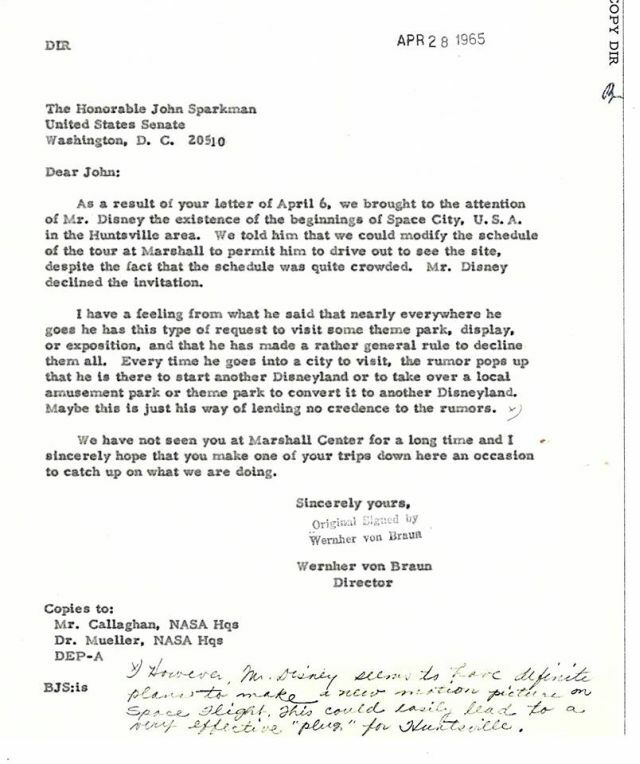 For a brief, shining moment in the early 1960s, Huntsville was going to have an amusement park that rivaled Disney World. Actually, it would rival Disneyland, because Disney World was still basically swampland. 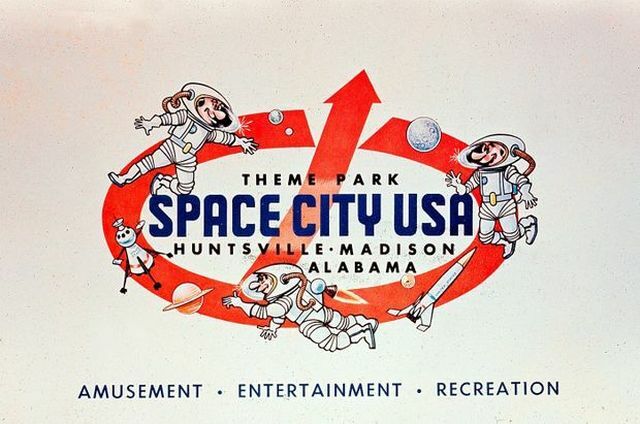 Space City USA was a planned theme park near Huntsville, Alabama. Located adjacent to Lady Ann Lake between Huntsville and Decatur, the $5 million (at the time) project was planned starting in 1959 as "Time World". Built around a space travel theme, popular at the time, theming also included "Lost World" with dinosaur models, a simulated moon colony, a "Land of Oz", and an Old South section. 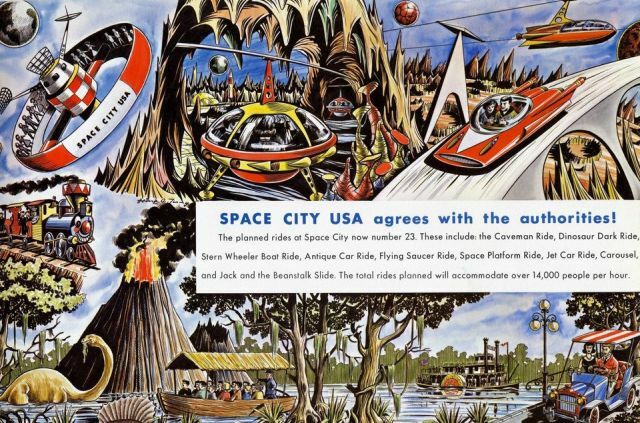 Space City would have a skyway ride, a glass-bottom boat, a lunar restaurant shaped like a giant mushroom, a jet car ride, a flying saucer, futuristic "time machines," a simulated colony on the moon and even a miniature volcano. Guests would enter through a "time machine" into various themed areas, like the Lost World with dinosaur models, a simulated moon colony, a "Land of Oz" and an Old South section. 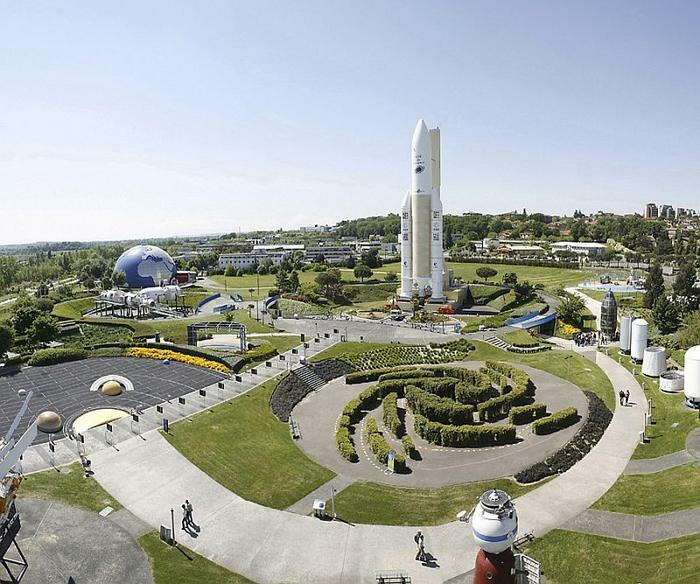 Estimated cost for the fantastic amusement park with space as its central theme: $5 million (about $35 million today). Number of annual visitors expected: 1.2 million. 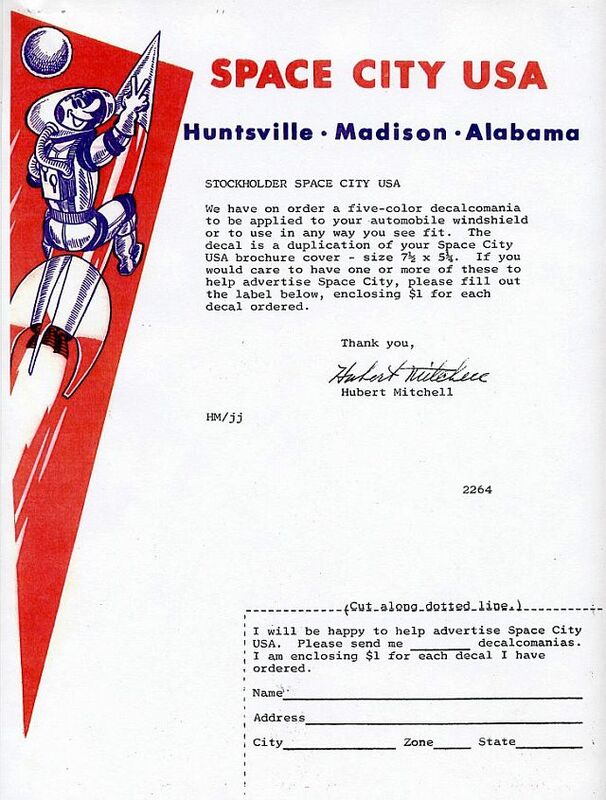 The curious, somewhat mysterious story of this footnote to Huntsville history began in January of 1964. It may have sounded crazy at the time ... but remember, those were the days when the farfetched notion of putting humans on the moon was sounding realistic. Huntsville, it seemed, could do anything. Even space pioneer Werner Von Braun was involved in the development! 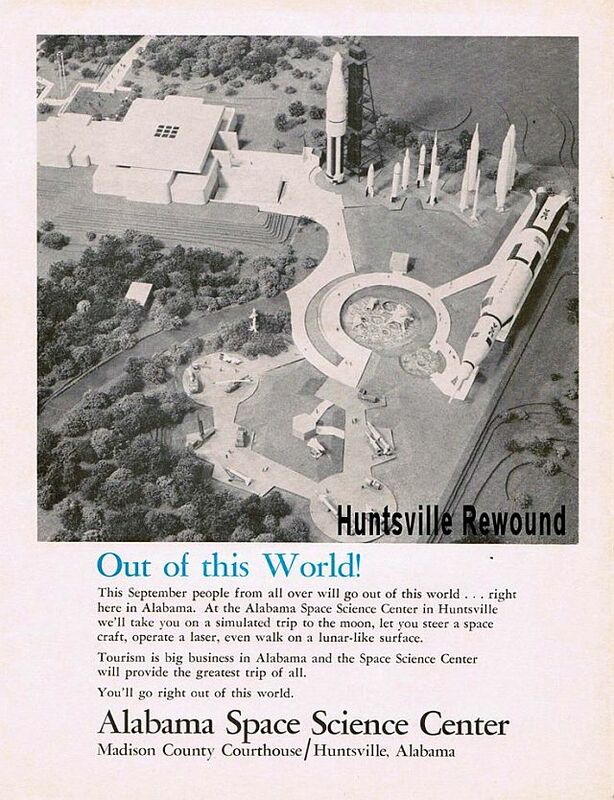 There was also the Huntsville Space center that displayed real spacecraft from the Golden Age of Rockets. 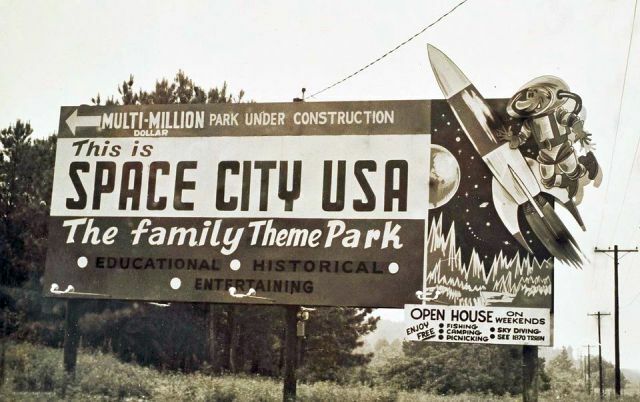 "Plans for a $5 million amusement park, with space as the central theme, were announced by officials of Space City USA last night. "The park will be located on an 850-acre site surrounding Lady Ann Lake between Huntsville and Decatur." 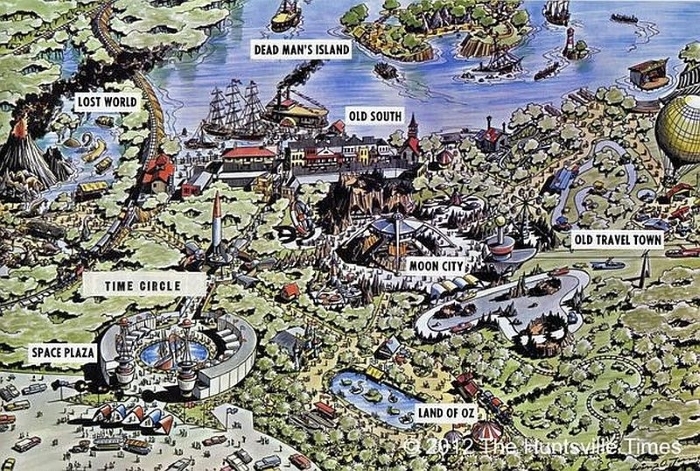 An artist's rendering showed the Time Circle, Lost World, Space Plaza, Moon City, Dead Man's Island and Old South sections. 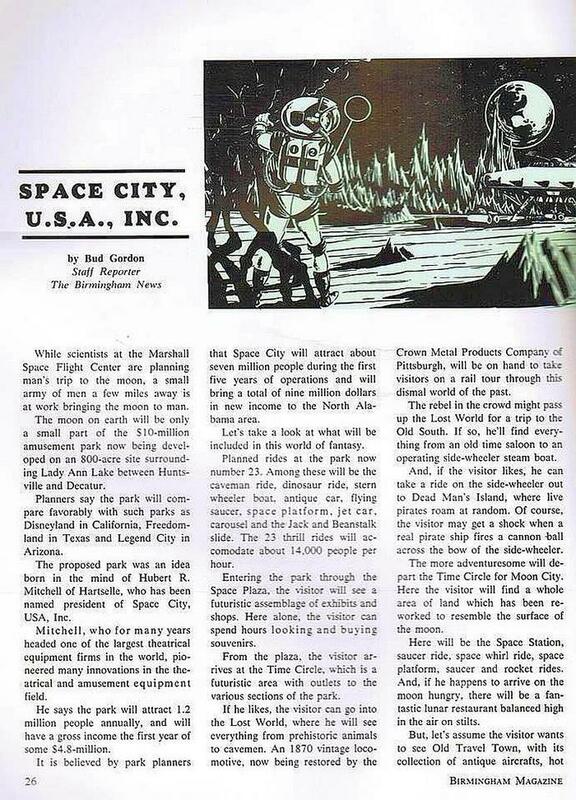 Space City USA would open in 1965. The park had been in the planning stage for three years. A photograph showed local dignitaries at the kickoff party at the Elks Club. Depending on your age, you might remember dimpled actor Dean Jones of Decatur, who was a huge star in 1960s Disney movies like "The Love Bug" and "That Darn Cat." He was in town for the party. The next day, more newspaper coverage stirred the frenzy. "If you would like to hurtle through space on a flying saucer, stop off at Mars and have lunch on the moon, you may not have to wait too much longer." Construction was to begin in the next few weeks along Alabama Highway 20 between Huntsville and Decatur, near Madison, off what is now Zierdt Road south of I-565. Kerry Pinkerton was 14 or 15 when Space City was announced and remembers "the hype." "This was front-page news in the mid-'60s in Huntsville," he said. 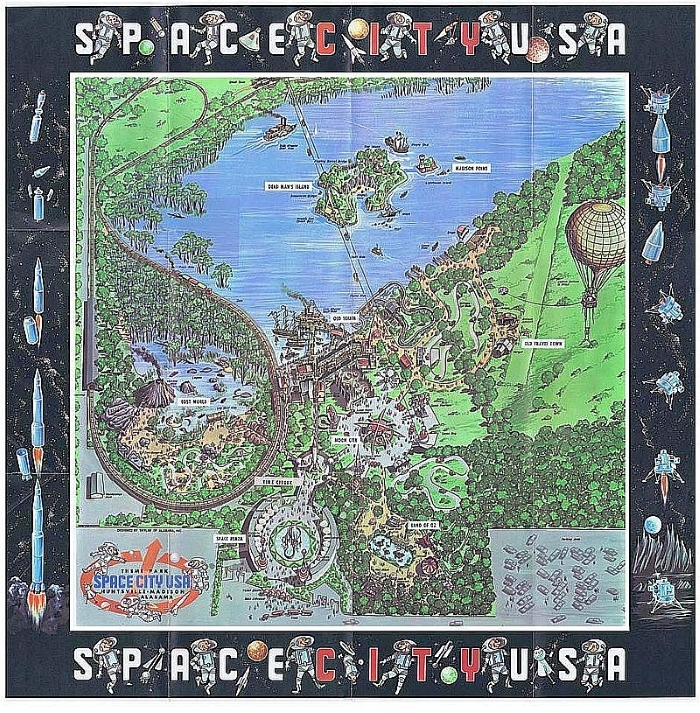 He vividly remembers eating breakfast with his father at a diner at the Jordan Lane/Holmes Avenue intersection and the placemats had the design for Space City. "It was a big deal," Pinkerton recalled. "Something to do in Huntsville -- golly, what a novel idea that would be," he said jokingly. A 12-page color brochure shows the plans in detail. 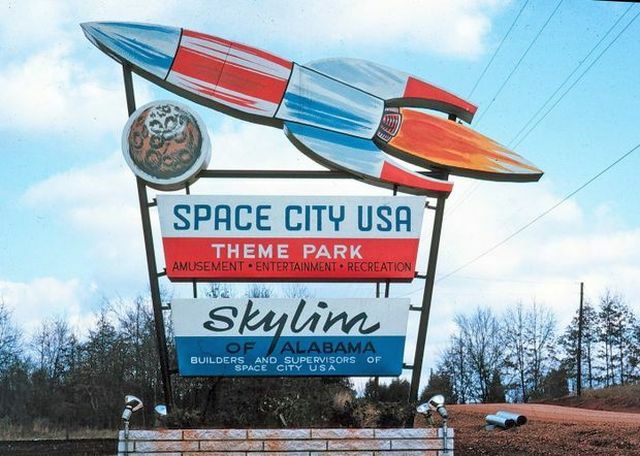 Space City USA chose Skylim of Alabama Inc. to lead the project under Glen Robinson, who "has been in charge of special effects at MGM Studios." 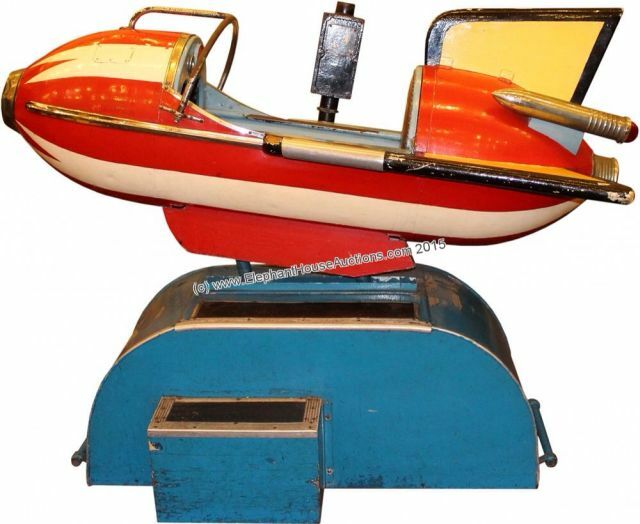 The Skylim team had worked on Disneyland in California, Pleasure Island in Boston, Six Flags Over Texas, Legend City near Phoenix and Freedomland in New York City, it said. Roughly 250 acres of land fronting Highway 20 "will be developed for shopping, motel and eating facilities," it said. Local investors were pretty excited about the planned park, too, and wanted a piece of the projected action. Longtime Huntsville resident and former school board member Toni Reynolds recalls that her late husband, Bill, a periodontist, invested money. She doesn't recall exactly how much, but in her garage in south Huntsville a peach and green flowered carousel horse is one of the few tangible items left from the project. A few people around town have them, she said. 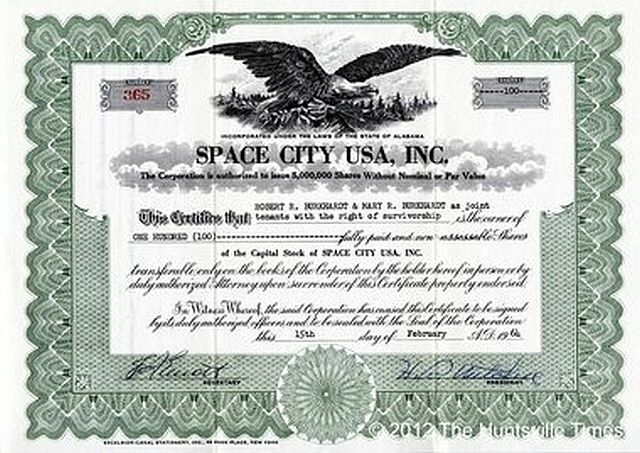 Space City USA stock certificate. 100 shares at $2.00/ share. It would not prove to be a good investment. But it seemed like one for a while. The ambitious project seems to have begun in proper businesslike fashion with real assets. According to documents from the Securities and Exchange Commission, the plan was to offer 2 million shares of stock at up to $2.50 a share. The SEC statement said the company that organized in 1963 "has acquired certain real properties and has erected its office building thereon. It is planning to construct thereon a motel at an estimated cost of $1,500,000, and it also has commenced engineering and grading work for the theme park." 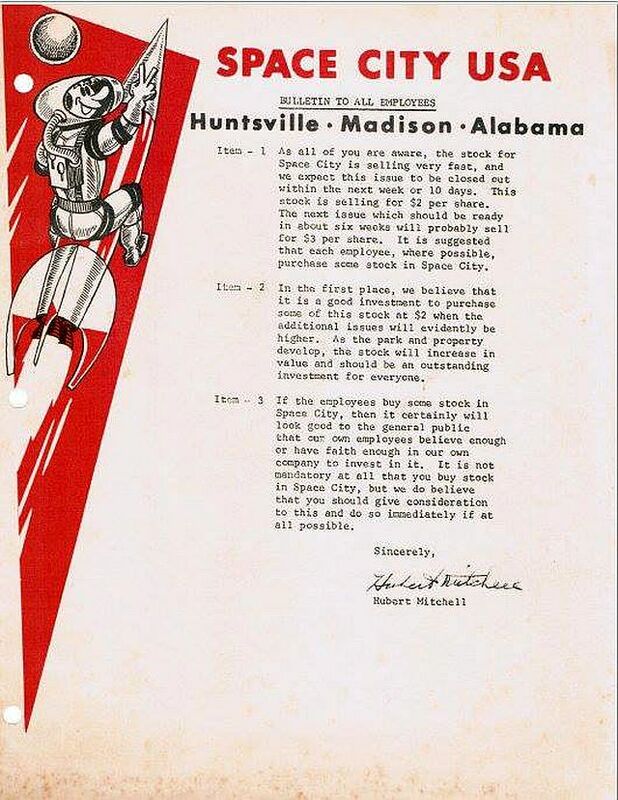 At that time, there were just over 300,000 shares of stock floating around Huntsville. "Management officials and promoters ... have acquired 187,500 common shares. "Recently, an additional 117,750 shares were sold to the public for $235,500," the SEC report said. Land grading started on the site in late January 1964. "Work is continuing on lowering the water in Lady Ann Lake approximately four feet to enable construction of Dead Man's Island, and the Side Wheeler Boat Ride," The Times reported on Jan. 31. 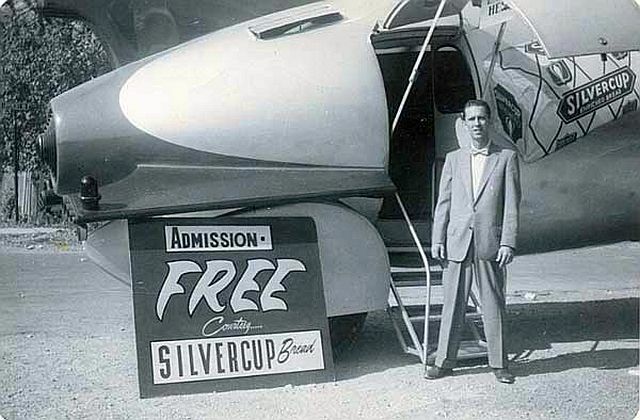 To generate buzz, an open house and a skydiving expo were scheduled in 1964. Word of the dazzling fantasy theme park wasn't just big news locally. 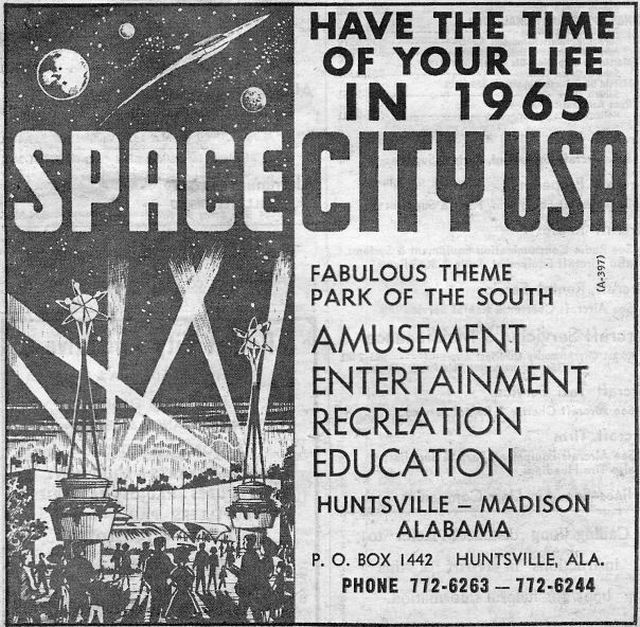 The Memphis Commercial Appeal ran a story on March 22, 1965, with the headline "Space City Park Will Open Near Huntsville Next Year." The article included an aerial photo and another of a little building called "the crooked house, in the Land of Oz, to be inhabited by witches." The 24 park rides would have an hourly capacity of 14,000, the story said. Visitors would come from 150 miles away and spend "about $3.80 each." Reynolds loaned The Times her husband's collection of slides from the early days of the Space City project. They show extensive land grading and a few small buildings. 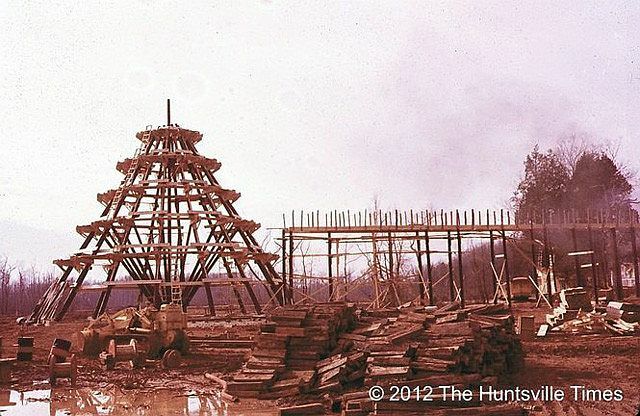 Metal girders standing in a teepee shape appear to have been the frame for the volcano. Today, Lady Ann Lake is the water that gives the upscale subdivision Edgewater its name. Developer Wayne Bonner bought the property for the project in the early 1980s. He remembers fishing there as a kid for 50 cents a day. When he had the opportunity to option the property for development, he took a closer look. "It was an overgrown area with a beautiful water supply," Bonner said earlier this month. Still, he remembers thinking "anybody would be insane to develop this property," mostly because of the site prep required on the rugged location. 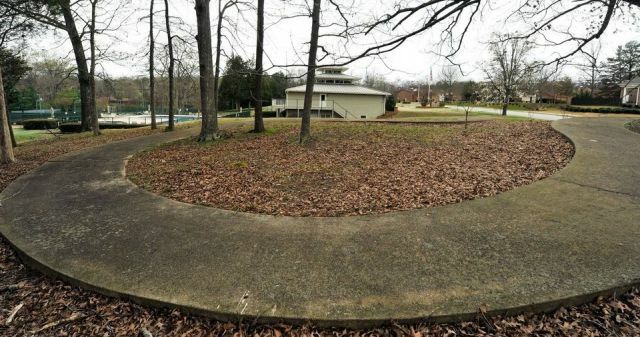 The property is half in Madison, half in Huntsville. 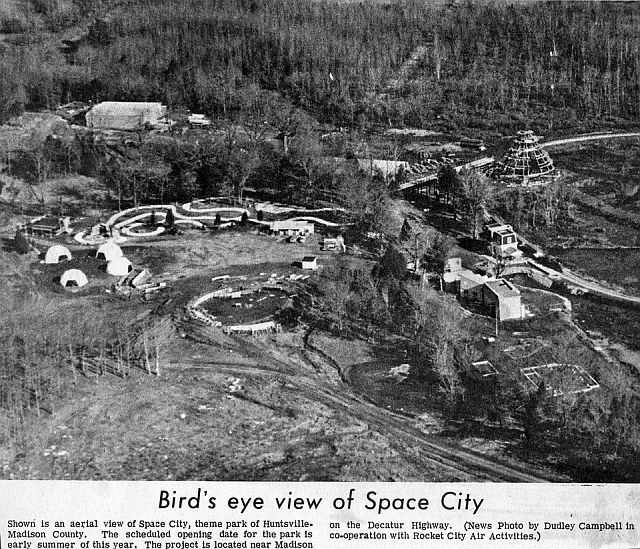 Bonner remembers hearing a little about Space City at the time but didn't realize anything was actually built. During early Edgewater development, he recalls seeing "an old concrete slab here, an old building falling down there," but not much more. After viewing Reynolds' slides of the construction, Bonner said "I had no idea they had gotten that far along." The property turned out to have numerous springs, Bonner would learn -- as well as endless stumps that had to be cleared. Workers in waders with chain saws spent months grinding them down. "It took two years to get the lake where it was a usable lake," he said. They found some old concrete pier blocks, train rails, a few crossties, a dilapidated building and a short sidewalk to the left of the Edgewater clubhouse in "a beautiful grove of oak trees," he said. "We consciously saved that." Today, that little curved sidewalk on a small hill matches a portion of the artist's rendering of Space City. A partial semicircle of concrete piers, located by Times photographer Bob Gathany, appears to line up with the design for the "volcano." More odd trivia: that volcano was to have been made with "the largest order of dental plaster ever placed in the world," according to reports from the time. After all that hype, all that talk around town, all the local kids' sleepless nights, the project apparently just fizzled. Local businesses filed suit to get paid. The project chairman blamed the weather for a lull in activity that slipped the opening date to the spring of 1967. A Times story in September 1967 suggests the reasons were unclear even then. 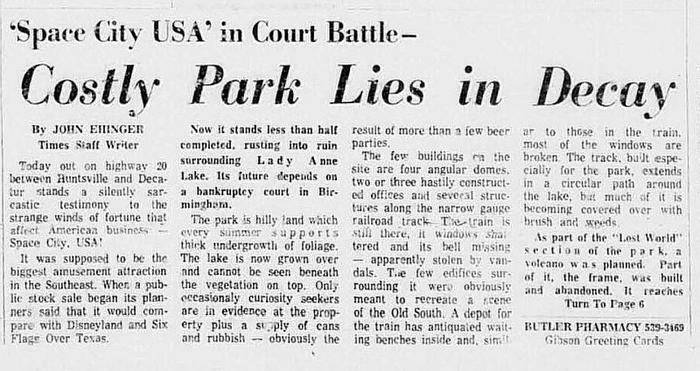 "Space City USA in Court Battle -- Costly Park Lies in Decay," read the headline. It described the overgrown site and a few forgotten landmarks "rusting into ruin." The train was still there, "its windows shattered and its bell missing." 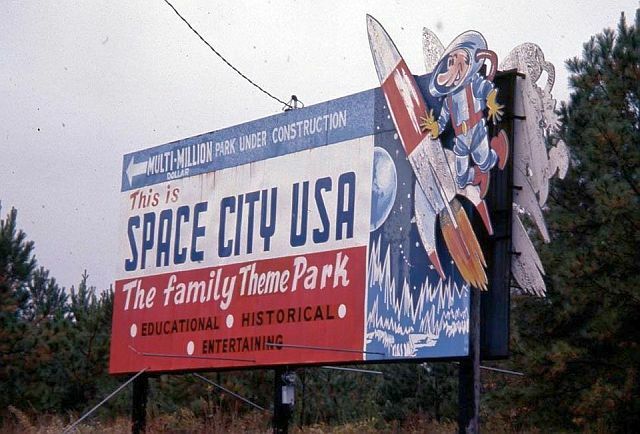 "Generally, it appears as though Space City was an ill-fated venture from its conception," reporter John Ehinger wrote. Investor Dr. Jimmy Wall, a local dentist who would later be a City Council member, doesn't recall any wrong-doing, just that "it was ahead of its time." From a lowered project cost of $2 million, only an estimated $500,000 was spent on actual construction. "What happened to the other $1.5 million? The answer reliable sources seem to agree on is that it was simply wasted by more planning, meetings, and long business trips," the 1967 story said. Was Space City too ambitious? Was investors' money frittered away? Was preparing the site too costly? "My impression is that there were some shady dealings going on," Pinkerton recalled. "It was the sort of thing kids were talking about." 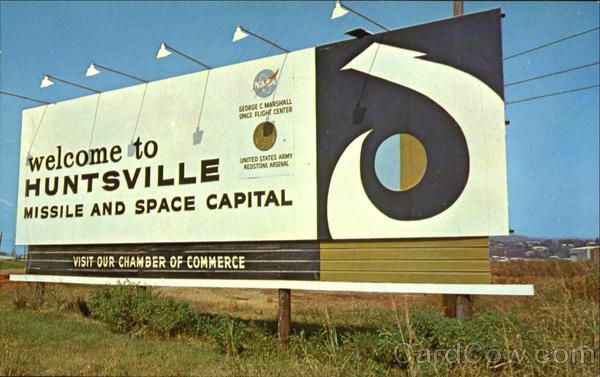 So on Oct. 17 1967, the sad remains of what might have made Huntsville another Orlando went on the auction block. By then, the newspaper condemned it as "an amusement park scheme which fell flat on its face and took some $2 million in capital with it." An ad for the auction detailed what was left. It included the train, five cars and track, a 60-horse carousel, a 1916 Model T Ford, three parcels of land, four "white structures called time capsules," an Old South railway station, one old mill house and "one crooked house." As late as 1971, the bankrupt firm filed papers in federal court for a reorganization to issue more stock. No word if there were any takers. 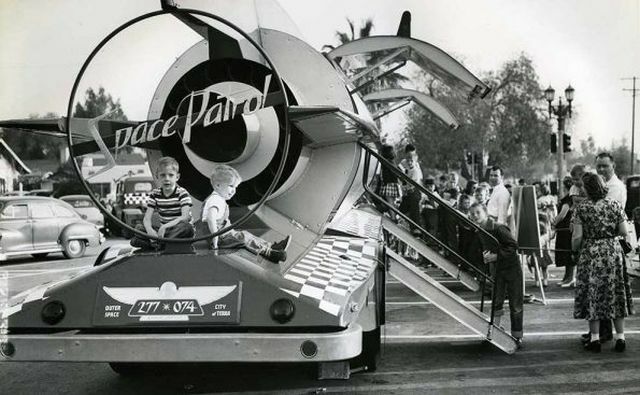 The dream is at least being realized in the STAR WARS world being built in the Disney parks, but....Wouldn't it have been great for us "Baby Boomers" from the SPACE PATROL - ROCKY JONES - TOM CORBETT generation to have had a place of our own back in the day! Hands down one of the best, if not the best, posts ever on this forum. You don't even need to read it, although I highly recommend it, because the images themselves tell the whole story! 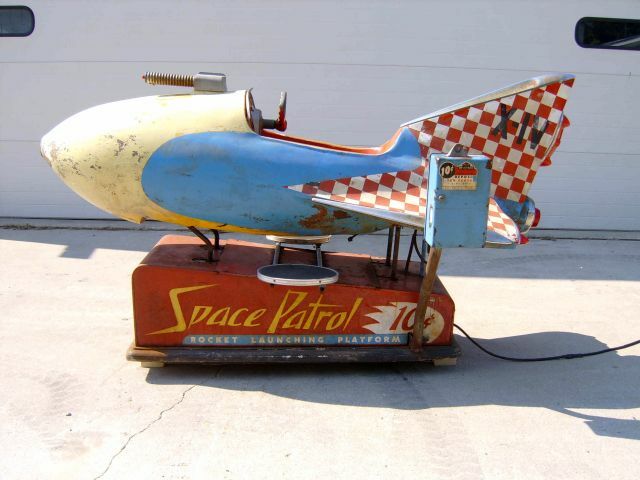 Although Space Patrol was only slightly before my time I find myself loving it for the same reasons I love "A Christmas Story". That feeling of nostalgia that reminds people my age how much fun we had back in the good old days when it seemed the sky was limitless. Thank you for a wonderful post. Thank you for the kind words Trek! 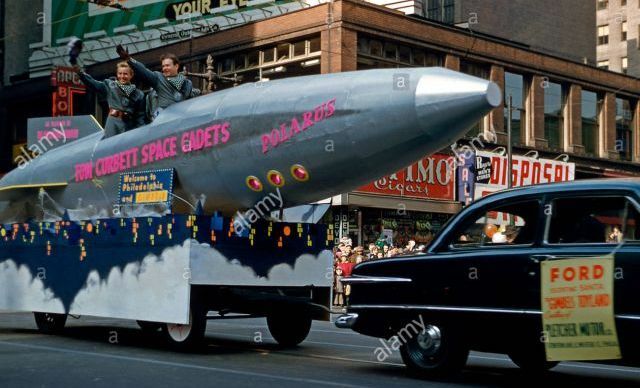 The whole subject of the 50's-60's "Space Fever" has always fascinated me---Especialy because I grew up in the midst of it (Right after the Davey Crockett fever!). This is a bit of an "update" on SPACE CITY. Most is from one source, but I've also drawn upon various web pages and Facebook memories. 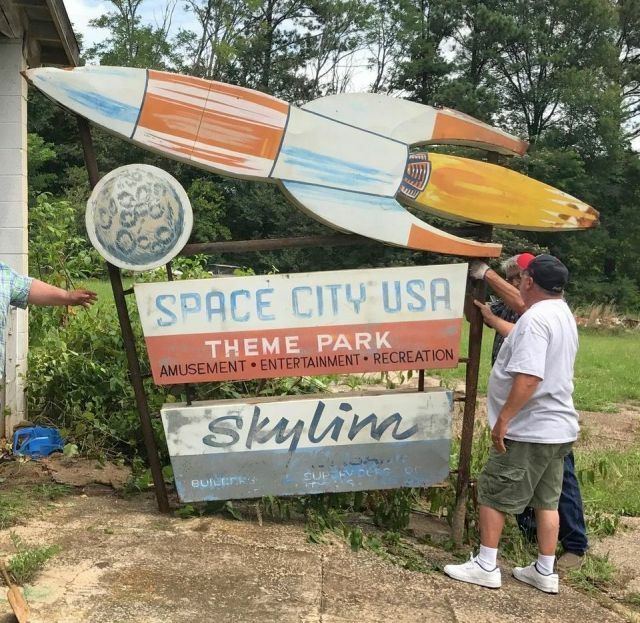 A large sign and other artifacts from Space City USA, a proposed theme park being built in Huntsville, Alabama in the 1960s were recently found in a deteriorating barn in Chickamauga, Georgia near Chattanooga. 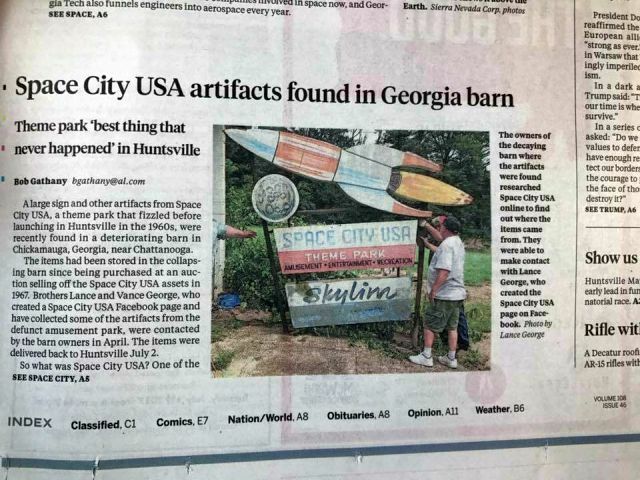 The items had been stored in the collapsing barn since being purchased at an auction selling off the Space City USA assets in 1967. 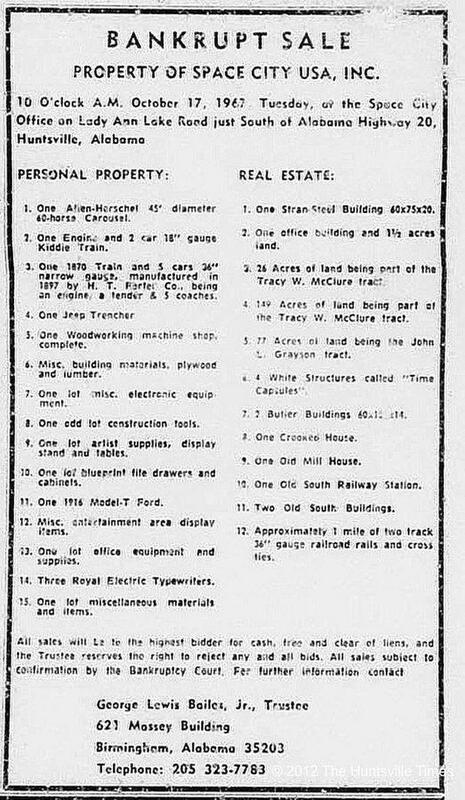 So on Oct. 17 1967, the sad remains of what might have made Huntsville another Orlando went on the auction block. By then, the newspaper condemned it as "an amusement park scheme which fell flat on its face and took some $2 million in capital with it." An ad for the auction detailed what was left. It included the train, five cars and track, a 60-horse carousel, a 1916 Model T Ford, three parcels of land, four "white structures called time capsules," . Little other physical evidence of Space City USA has been found until just recently. 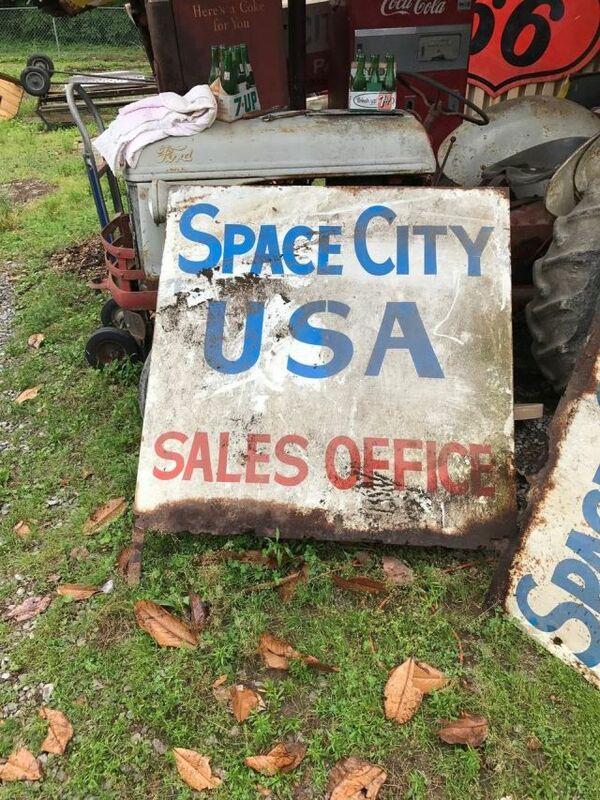 The Space City USA sign that was erected in front of the Space City USA office on Alabama Highway 20 on Space Age Rd. 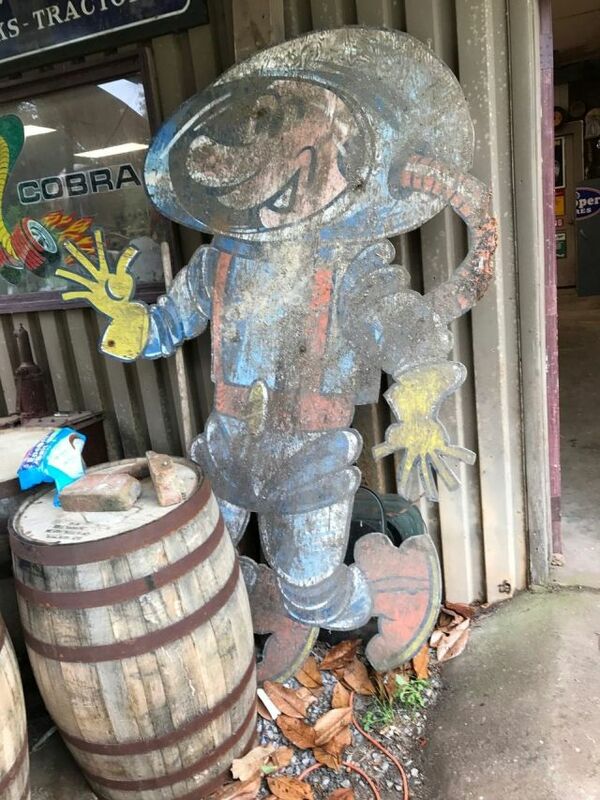 was recently discovered in Chickamauga, Georgia. 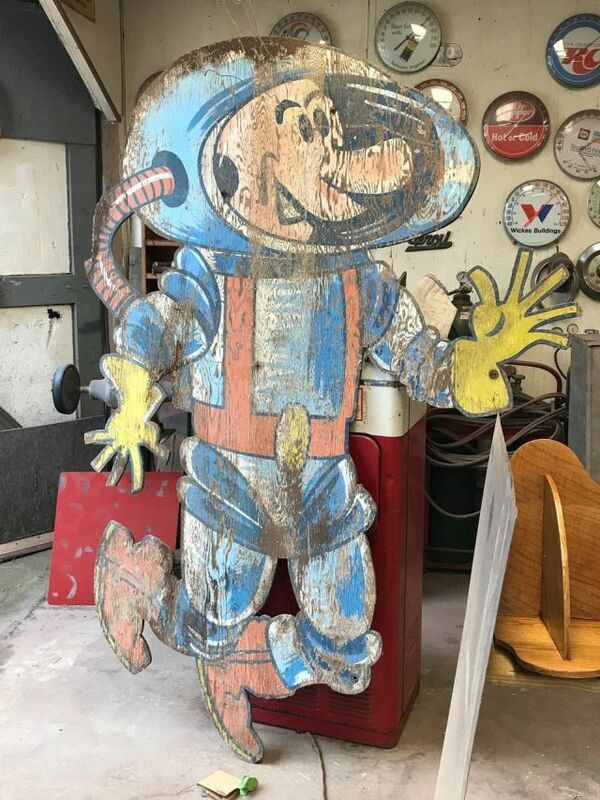 In addition to the sign, two wooden plywood astronaut characters that appeared on the Alabama Hwy 20 billboard were found. 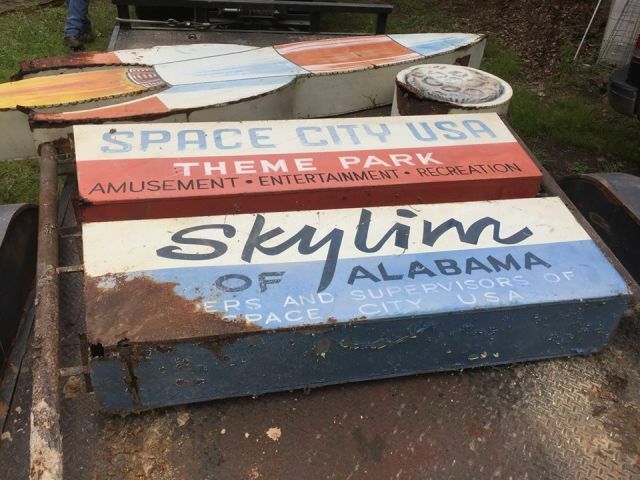 The large sign, 2 small signs and the two plywood space people had been in storage since being purchased at an auction in 1967 selling off the assets of Space City USA. 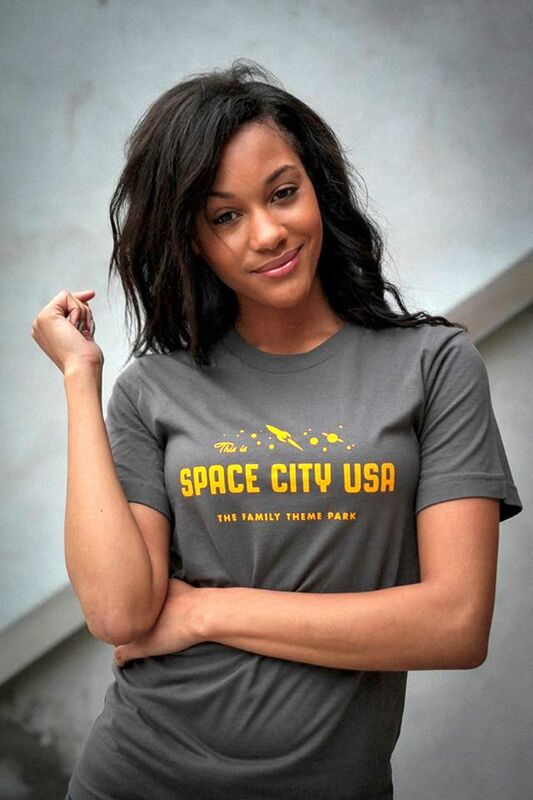 The owners researched Space City USA online to find out where the items came from. 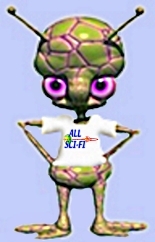 They were able to make contact with Lance George who created the Space City USA page on Facebook. 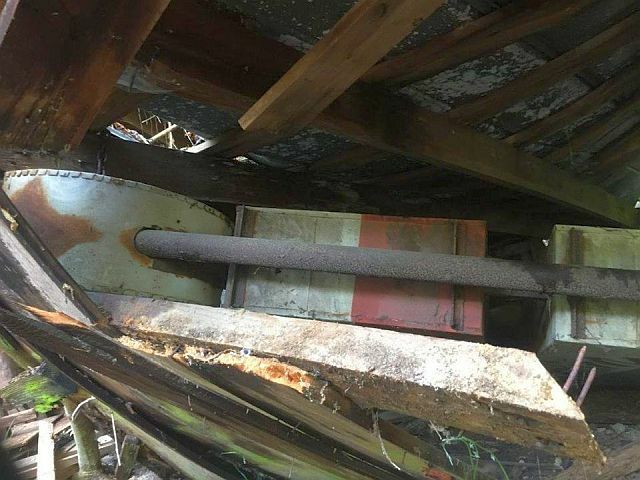 The barn where the items had been stored since 1967 was caving in. The current owners actually thought it might be part of a boat because they saw a fin sticking out of the pile. 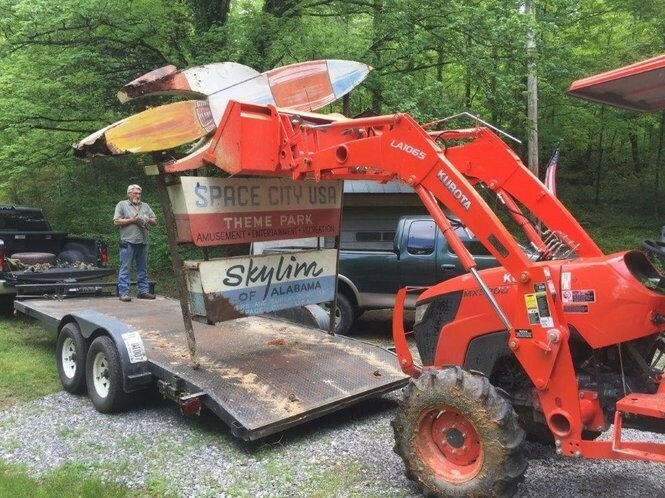 After removing the items from the barn, brothers Lance and Vance George were able to load the historic artifacts onto a trailer and bring them back to Huntsville, Alabama. 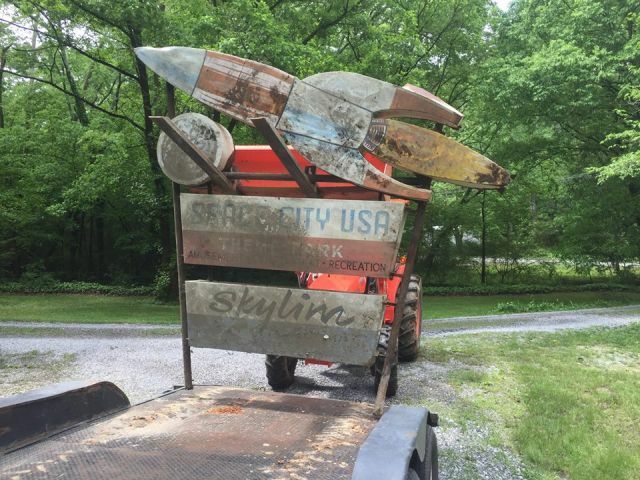 The plan is to restore the signs and figures and make them part of the "George" collection. There IS a real "SPACE CITY" in existance! 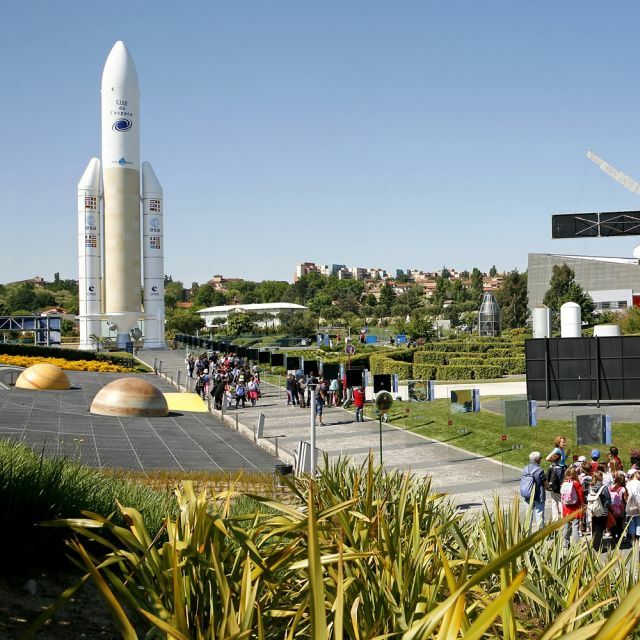 It's not a SPACE CITY U.S.A.---It's a SPACE CITY FRANCE! While constructed quite a bit later than the "Spaced-out 60's" , This is still a homage to that dream. The following is edited from the info re: the site. 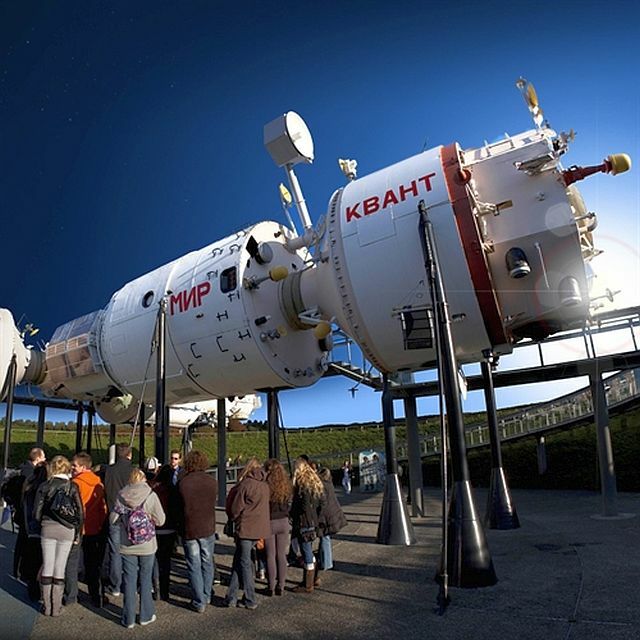 "In the Cité de l'Espace or Space City Park in Toulouse, France, exploration is a unique experience, with life sized space vehicles: step on to the 1st generation Soyouz space vessel and the exact replica of Mir, the famous space station in which dozens of Russian cosmonauts are trained. 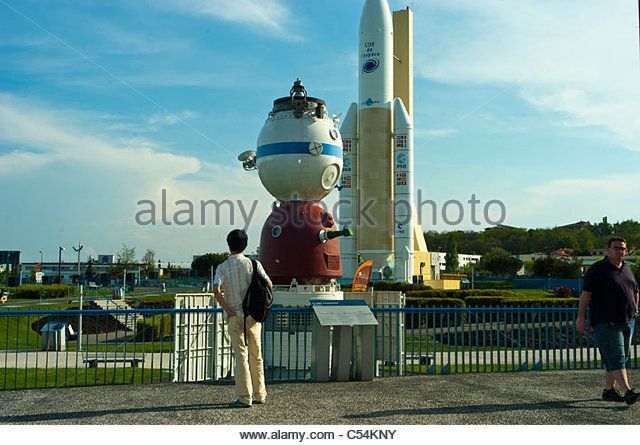 Admire, as if you were in Kourou, the Ariane 5 rocket, 53 metres tall! Total immersion is guaranteed in the Cité de l'Espace with two auditoriums equipped with the latest in terms of image and sound technology. In the IMAX cinema (a giant screen and 3D goggles) and the planetarium (360° screen and astronomical simulator), visitors are no longer spectators of the sky, they are in space! 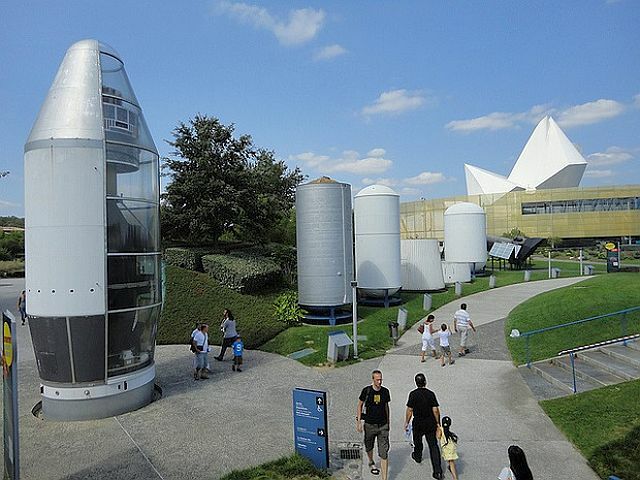 The museum has a lot to offer for children, with the Little Astronaut Square, a very special space playground. The Children's Base, the new attraction for children, opens on a world with a breathtaking setting in which children are space heroes! In the Stellarium, a planetarium for young children, a marvelous tale will take children into the magic of stars to discover the constellations. 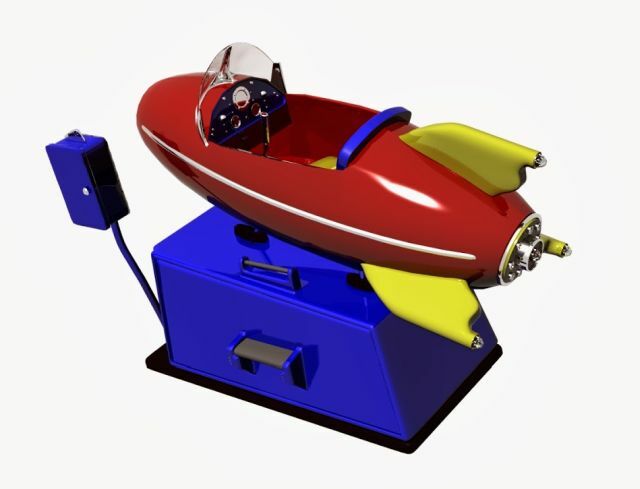 In total, over 250 exhibition pieces, most of them interactive, enable you to test, learn and dream!" 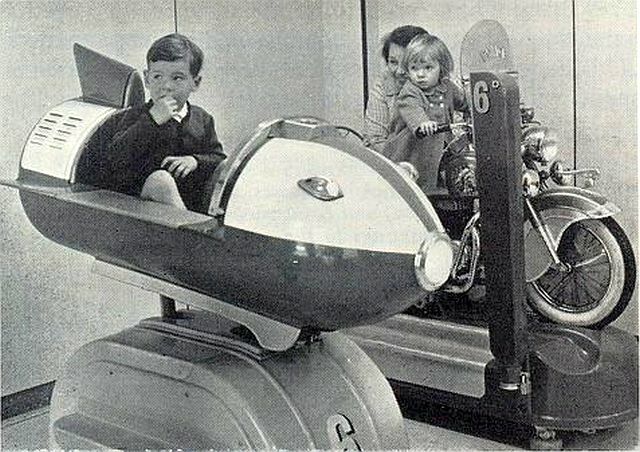 More "Space Rocket" rides from the 50's ! A REVISIT OF SOME GEMS ! ANYONE HAVE ANY MORE ???? Excellent! And your French Space City post is terrific, too. You should receive a knighthood for this! A whole new kind of "touring rocket"! You just hop in and "tour" around the neighborhood. It's gorgeous, Space Cadet Eadie! 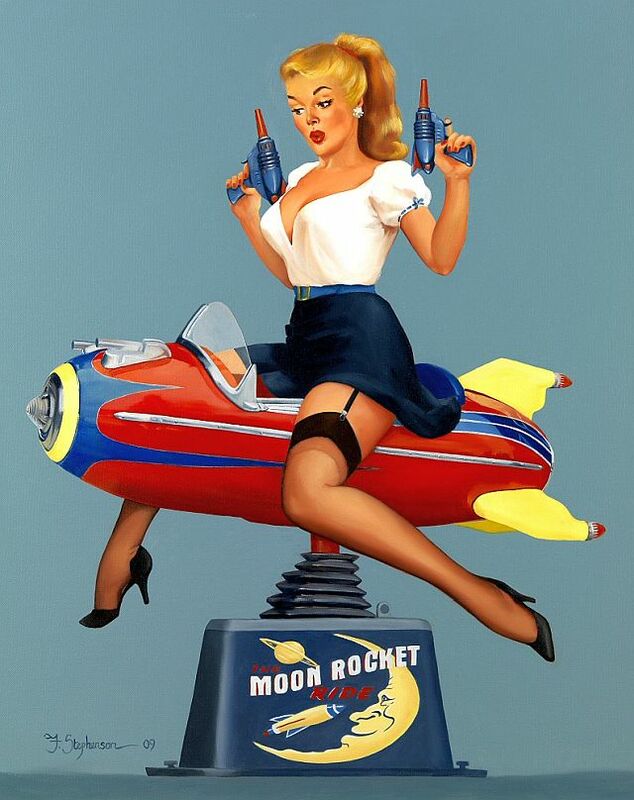 You can "rocket" straight to the head of the class. I bet it has a motorcycle engine in the back there! No internal gas engine of ANY type. It is completely electric! So . 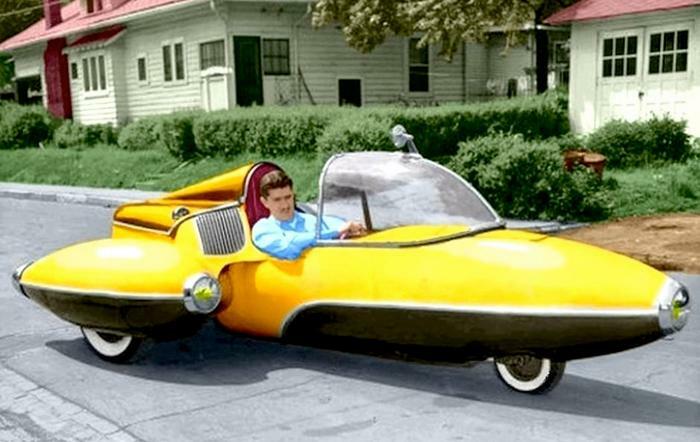 . . it's NOT "the ULTIMATE peddle car" as you said? Eadie, me darlin' . . . which is it? 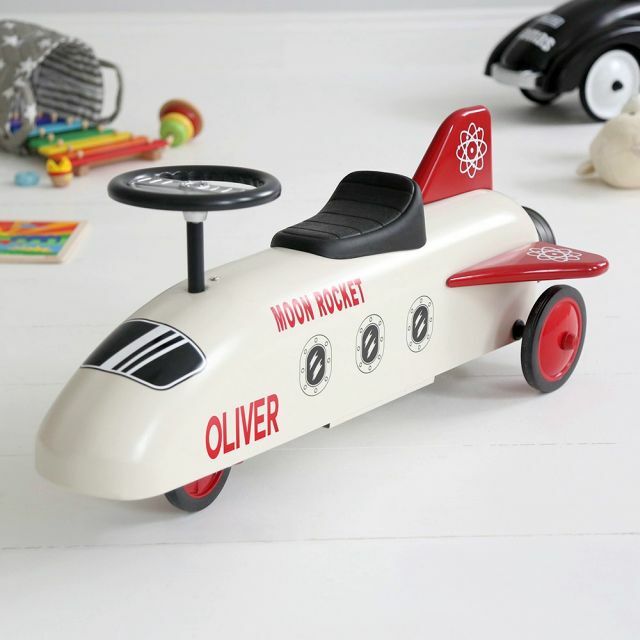 No, it's the ultimate pedal car. Unless you're using it to sell stuff. Pye-Rate found this on his Facebook page. According to the post, you must peddle it to "jump start" it and to re-charge the batteries. It doesn't appear to have a plug in.